I considered zombies the worst enemy ever to walk the earth. Humans can be more dangerous than monsters. Me, the girl who valued truth above almost anything, lived in a tangled web of lies. My knees knocked together. I fit my hands at her temples, my chest throbbing. Today's life lesson? One bad decision could mean a lifetime of consequences. "It didn't have to be this way," I said and closed my eyes. I hate when my favorite book series end. Like, really really hate it. But when a series ends in such an amazing way, it makes the pain a little more bearable. 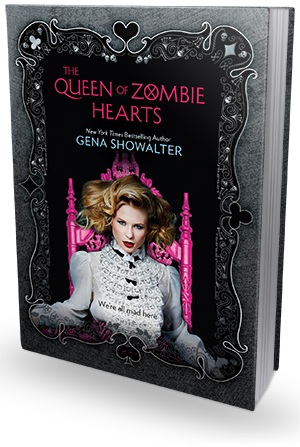 The Queen of the Zombie Hearts is one of the those endings that gives me such closure and such an amazing feeling of hope. Gena throws us into a full on war within the first few chapters. Anima attacks, slayers are missing and some are dead. Things for Ali and Cole, along with the remaining slayers, are getting more dangerous every day. They don't know Anima's plans and they're trying to recover from previous attacks while simultaneously preparing for future ones. Ali is one of my favorite YA heroines and Cole a favorite YA boyfriend. Not only are these two individuals amazing on their own, but they're relationship is so stinking cute and strong - and it should be given all they went through in Through the Zombieglass. There are so many plot aspects that I wish I could talk about, but I want you to be as surprised by them as I was. However, I will tell you that if you are a fan of this series, you want to read this book sooner than later. If you haven't started The White Rabbit Chronicles yet, you best get on that. Gena is an amazing author and the way she ties all the lose ends, even ones she has introduced in this novel is nothing short of masterful. Her writing keeps you engaged in the story and flying through pages. Normally I can get distracted by outside forces (TV, Joe yelling at football, etc. ), but while reading The Queen of Zombie Hearts it all just fell away. The White Rabbit Chronicles has without a doubt earned a coveted spot on my "series I will fore sure re-read" list. With a white-hot romance, amazing characters (both main and supporting), gripping plots, and jaw dropping twists, these are books that need to visited again and again.